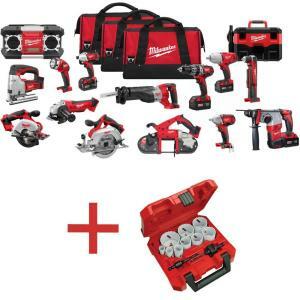 Click the button below to add the Milwaukee M18 Red Lithium Cordless 15 Piece Combo Kit with Free 13-Pieces Holesaw Set to your wish list. The 2696-15 M18 cordless lithium-ion 15-tool combo kit includes the ½ in. Hammer Drill / Driver (2602-20), Sawzall Recip Saw (2620-20), Circular Saw (2630-20), ¼ in. Hex Impact Driver (2650-20), 4.5 in. Cut-Off/Grinder (2680-20), ½ in. High Torque Impact Wrench (2662-20), Right Angle Drill (2615-20), Jig Saw (2645-20), Band Saw (2629-20), 7/8 in. SDS Plus Rotary Hammer (2605-20), 5-3/8 in. Metal Saw Kit (2682-20), ½ in. Compact Impact Wrench (2652-20), Wet/Dry Vacuum (0880-20), Jobsite Radio (2790-20), and Work Light (49-24-0171). The M18 cordless lithium-ion System ft. s patented technologies and electronics, innovative motor design, and superior ergonomics provide the most efficient blend of power, weight and performance in the industry. Powered by red lithium the M18 cordless system delivers more torque, more power, and longer run-time than the competition. With the Purchase of the 2696-15 M18 red lithium 15-Piece combo kit receive a Free 13Pc Holesaw Set, a $69.97 retail value. With the purchase of the 2696-15 M18 red lithium 15piece combo kit receive a Free 13Pc Holesaw Set, a $69.97 retail value.